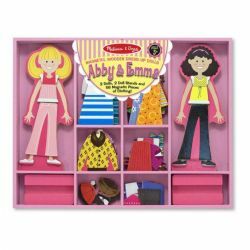 This wooden magnetic dress-up dolls play set includes two doll figures and 56 pieces of magnetic clothing that fit onto either one. Mix and match hundreds of possible doll outfits. Each magnetic fashion doll comes with a wooden stand for display. Ages 3 and up.